Protein Cereal Bars with Chocolate & Peanut Butter anyone? 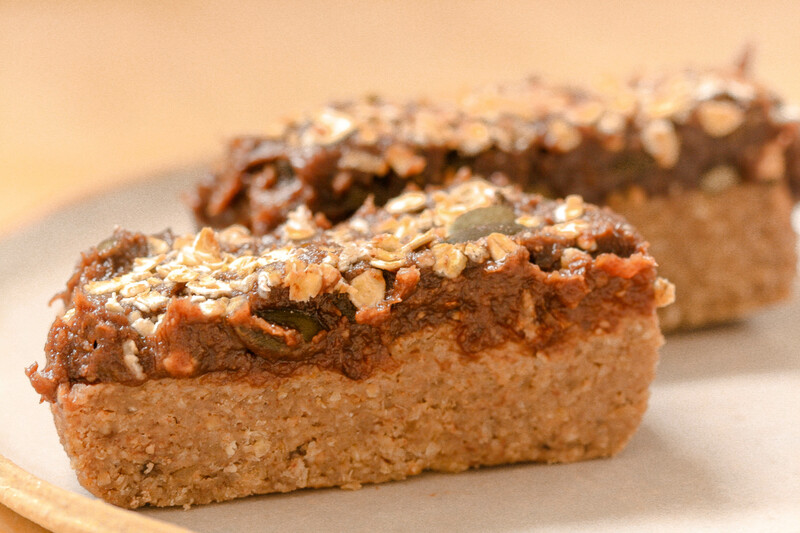 😊 Here is the recipe for a delicious and nutritious Cereal Bar that is packed with proteins. 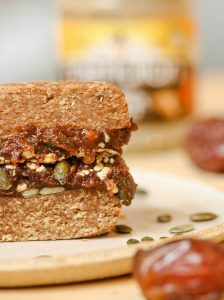 Perfect for breakfast, or as a pre- or post- workout snack. I always crave something sweet around 4 or 5 o’clock and love to prepare myself a little tea-time treat when I am at home, nothing too complicated I usually grab some leftover cakes that I always keep in the freezer (in case of emergency!) or if I have some time ahead of me I would make some crepes. But those days do not happen often enough and most of the time my tea-time is spent outside the house, working. I like to plan, especially when it comes to food, and so on the days spent out of the house I would normally have one (or 2 😉) of my homemade Protein Cereal Bars with Chocolate & Peanut Butter in my bag. 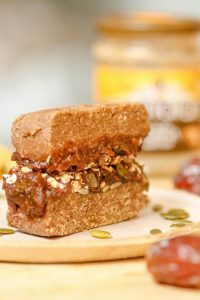 I like to adapt this recipe according to what I have left in the cupboard, and one of the good thing about these Protein Cereal Bars with Chocolate & Peanut Butter is that I could get rid of my half empty jars. I had a few spoons left of my favourite Meridian crunchy peanut butter and figured out that I could mix it with my overripe bananas, a little bit of pumpkin seeds, some hemp protein powder and a lot of oats. I LOVE chocolate, so I have added a simple, delicious and super gooey chocolate ganache on top. The ganache has no refined sugar, I have used dates instead as I like to make my Protein Cereal Bars with Chocolate & Peanut Butter with as little sugar as possible. 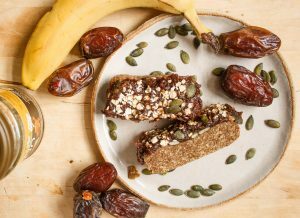 The great things with dates is that they taste naturally sweet and caramelised, which makes them a wonderful substitute to sugar, not only in taste but more importantly for their health benefits. Finally, I always have a bag of roasted peanuts in the kitchen so I added those as well for an extra crunch! With or without chocolate ganache ? I bought my Hemp Protein Powder in Holland & Barrett, a bag of 300 grams goes a long way as you only need a small amount, I usually have ½ tsp. in my porridge for breakfast or in my cereal bars. 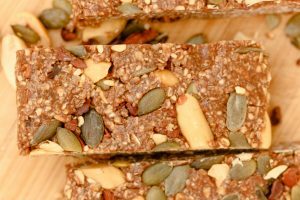 However, the pumpkin seeds are another great source of proteins so it would be fine not to add the hemp protein powder if you do not have it. I promise you that your Protein Cereal Bars with Chocolate & Peanut Butter would be as delicious with or without :). I hope you try and like these Protein Cereal Bars with Chocolate & Peanut Butter, if so let me know! Share on Pinterest and tag a photo on Instagram #mimies_delicacies so that I can see your lovely creations as well as helping me reach more of you lovely people. Merci my friends! 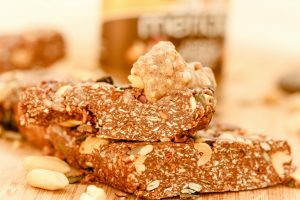 These easy to make Cereal Bars with Chocolate & Peanut Butter are a delicious and nutritious treat that is packed with proteins. Place the oats in your food processor and blend until finely ground. Add all other ingredients and mix until it becomes sticky. Spread the mixture evenly into a square pan, pressing down with your hand or with the back of a spoon to make it compact and even. Slice the dates into small chunks (if too dry leave them in a bowl of hot water for 10 minutes) and blend in your food processor until it becomes a paste. Add the sliced banana, cocoa powder, cinnamon powder, sea salt and mix until well combined. Transfer the ganache into a bowl and mix in the pumpkin seeds with a wooden spoon or spatula (to keep them whole). Spread the chocolate ganache evenly on top of the bottom layer. Cover with cling film and put in the freezer for at least an hour.